The elegant Windstar Yacht sets sail from Monte Carlo, Monaco in Europe for another adventurous cruise. 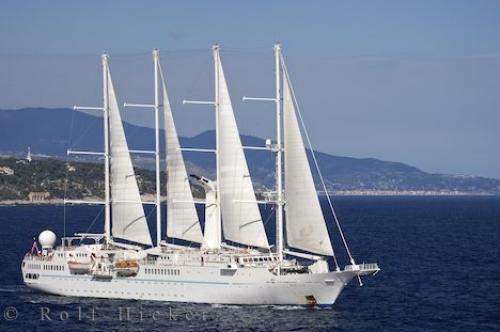 The magnificent four masted yacht known as the Windstar Cruise Ship sails throughout the Mediterranean and Caribbean Seas on a variety of different tour schedules. The Windstar is a luxurious yacht geared towards adults looking for a romantic getaway while sailing the high seas.The Windstar makes a stop in Monte Carlo, Monaco so passengers can go ashore and check out the amazing European city life of this beautiful resort. The Windstar yacht moors at a few different glamorous ports depending on the cruise destinations you choose.While aboard the Windstar yacht you will find a casino, bistro and bar, spa, library, pool, sports programs and other endless activities to entertain you while at sea. Photo of the Windstar luxury yacht leaving the harbor of Monte Carlo, Monaco in Europe.